A life of TRUE submission means living in complete obedience to the Holy Spirit. A person of TRUE submission accepts gladly whatever happens in their life and with thanksgiving, knowing that it was for their well being, whether in appearance or thought it is perceived as good or bad. Anba Bishoi's mother modeled submission during his childhood. An Angel of the Lord appeared to his humble mother and told her, "The Lord wants one of your sons to serve him forever," and the angel pointed to young Bishoi. The mother asked the angel, "Can you please choose another, this son is the weakest of them all." "He is weak," the angel replied, "but the strength of the Lord will always be with him." She then was submissive to the Angel of the Lord. As the young Bishoi grew and became a man he was filled with great desire to pray and converse with the Lord. He was known to continually sing hymns to the Lord and to talk with Him while working and at home. Bishoi's thoughts soon became that of God. The Apostle Paul lived and experienced a life of submission in a manner much the same. St Paul said, "But we have the mind of Christ" (I Corinthians 2:16), therefore when thoughts become that of God it is a normal result of the life of submission. If a person submits his life completely to the Lord Jesus Christ, the Lord will guide their thoughts. The Psalmist said, "I was so foolish and ignorantYou hold me by my right hand. You will guide me with Your counsel" (Psalm 73:22-24). St. Bishoi dreamed of living among the monks. He found great joy and happiness in fasting, praying, praising the Lord Jesus Christ, and seclusion. As a monk we know that Anba Bishoi felt that his life was in the hands of God who loved him and who was able to rescue him from any difficulty or tribulation. He submitted all his life to the Almighty Lord, "for of Him and through Him and to Him are all things" (Romans 11:36). There are many popular stories about the life of this most beloved monk. One hot day, we are told, while Anba Bishoi was reverently praying, he noticed a monk who looked very tired, thin, and hungry. So he invited this poor monk inside his dwelling to rest and take refreshment. Anba Bishoi brought him food and water and washed his weary feet. Anba Bishoi felt very happy and serene in His presence. The tired monk's face shone and a heavenly smile appeared upon His face. Anba Bishoi felt as though this monk knew of Heaven. As the monk left, he smiled and said, "You are beholding the Lord Jesus Christ. I came to visit you and bring many blessings to you." The monk then ascended into Heaven. 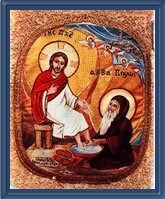 Anba Bishoi kissed the place in which the Lord sat and drank the remainder of the water in which the Lord's Holy Feet were washed. Because Anba Bishoi submitted his life to the Lord he beheld "wonders" of the Lord. Anba Bishoi did not hinder the work of the Spirit of God in Him and as a result he received many personal graces from the Lord. The more Anba Bishoi submitted himself to the Lord the more the Lord was obliged to care for him. The Psalmist said, "Because he has set his love upon Me, therefore I will deliver him; I will set him on high, because he has known My name. He shall call upon Me, and I will answer him; I will be with him in trouble; I will deliver him and honor him. With long life I will satisfy him, and show him My salvation" (Psalm 91:14-16). There is another endearing story of Anba Bishoi, which tells of the monks in the monastery where he resided, learning of a visit by the Lord Jesus Christ in the day to come. The gathering with the Lord was to occur on a high mountain near the monastery. Each monk was busily engrossed in preparing for the Holy Event. Early the following morning, they hurriedly journeyed up the path of the mountain so they could spend as much time as possible with the Lord. Sitting beside the mountain was a frail, elderly man that quietly implored each passing monk to take him with them to see the Lord. Yet each one thought that helping this man who could barely walk was a waste of time as they needed to hastily climb the mountain and had not a second to squander. The elderly man with his very soft voice asked Anba Bishoi for his help. Anba Bishoi tarried behind without hesitation. He helped the aged man up and carried him on his back for the man could not walk further than a few steps at a time. The mountain was not an easy climb, the aged man grew heavy and Anba Bishoi became fatigued. Yet he was more than happy to help the man. Not one disgruntled thought entered Anba Bishoi's mind regarding being late for the Heavenly Encounter. Suddenly, the frail man's weight became so very great that Anba Bishoi could no longer carry him. He gently and carefully placed him down and when he turned to speak to him, Anba Bishoi beheld the face of the Lord Jesus Christ. What great blessings Anba Bishoi once more received. He sat and conversed with the Lord for many hours. When the Lord left, He asked him to tell the other monks to remember the needy. "When they help the needy, they help Me," were the last words the Lord spoke to Anba Bishoi on that great day. Upon finding the other monks gathered at the top of the mountain, they asked Anba Bishoi, "Why has the Lord not come?" He replied, "The Holy One has been to this mountain, this great day." Anba Bishoi conveyed to them what had happened and upon hearing this they felt great regret and many monks wept for refusing to help the Lord. As Anba Bishoi's example certainly shows us, a life of submission encourages one to acquire other spiritual virtues such as obedience, patience, and endurance. Ones' will is the only thing that stands against acquiring these particular virtues. A person who does not submit himself to God cannot be obedient, because obedience is submission. Submitting oneself and accepting certain circumstances even when it does not appear to be the advantage of the goals set for oneself, cultivates the virtues of patience, and patience enriches lives and produces perseverance. It assists us in climbing up the many mountains before us to reach our Heavenly Goal. "And we know that all things work together for good to those who love God, to those who are called according to His purpose" (Romans 8:28). May we all learn from Anba Bishoi's life of submission that it is not life's circumstances, which dictates our daily lives. Circumstances and events are outside and beyond us. They cannot touch us when we remain submissive to the Lord Jesus Christ. The most important thing in our daily lives is "Abiding in Christ" (John 15:4-10) and staying there.